I recently found myself nearly slipping down the insidious slope of despair while reading the daily newspaper. Sipping a hot cup of coffee in my warm little nest, I read two stories that pushed me right up to the edge of hopelessness, or it’s more comfortable and familiar cousin, indifference. I’ve backed away, though, and what I would like to suggest is an antidote for futility and despair, a methodology of hope that can move us away from the edge and help us heal and transform the pain we encounter daily. To begin, here are the stories, both from the New YorkTimes. The first tells of 22 children under the age of 5 dying of the cold in Afghan refugee camps in the past month. Displaced so long by war, the plight of 35, 000 people no longer qualifies as an emergency or humanitarian crisis. And so there is very little aid to provide already-struggling families with heat amidst an unusually cold Kabul winter. Little ones are freezing. Literally. Ponder the issue of why all of these people are in refugee camps in the first place, and our collective, paid-for- by- our- taxes responsibility for their suffering. Lest the lack of such a basic human necessity as warmth seem like a distant problem, consider the other news story. Cutbacks in heating assistance to Americans struggling in poverty has resulted in desperation and extreme efforts to stay warm right here in the United States. An elderly man in Maine, with no more credit available for heating oil, walked into an oil company office with the title to his 16 year old car, offering it as collateral for an oil delivery. He and his wife had been attempting to keep warm with a fan circulating the heat from the burners on their electric stove. I tried to let these stories in, and found it difficult. Nothing in my experience compares. Several years ago, I spent the coldest night of my life in an unheated cabin in the Pennsylvania woods: misery, and it wasn’t even freezing. I imagine my now-grown children as babies and toddlers, but from my comfortable home I cannot know what it feels like to wrap oneself around the tiny body of a fatally shivering daughter or son. And so I found myself icing up my own heart, trying to become comfortably numb to the human tragedy of these circumstances. Stories like these can be overwhelming. After all, what can we do about the people in Afghanistan or even Maine for that matter? But that’s the paralyzing question, not the generative one. That question is: “What can I do right here, right now, to Warm Somebody?” Each of us has a different answer; it’s worth wrestling with. Recently, the mainstream media seem to be paying more attention to the issues facing people living in poverty in the United States. Even presidential candidate Mitt Romney’s sad, uninformed gaffe about not caring “for the very poor” has had the positive effect of raising a cry of outrage. This is good news. Too often, the lives of people living on the margins simply are ignored, omitted from public discourse. And when they do penetrate our consciousness, we often do what I did…distance ourselves, anesthetize our hearts and minds. Maybe it will all go away. But it doesn’t, and we really are One. Our collective well-being is intricately interconnected. So let’s resist becoming numb. Let’s let the pain in and allow it to expand our hearts. Whenever something distresses you in the news, take a moment to let it in, allow it to enlarge you, reflect on it, and then ask yourself what response your heart wants to make….and make it. It’s increasingly clear that our elected officials will not lead us to equality and justice for all; that power resides in us. As the Hopi Elders have said, we are the ones we have been waiting for. So let’s all do what is uniquely ours to do. If you know that someone on your block or in your neighborhood is struggling to stay warm this winter, arrange to pay their heating bills for a month, or drop off some thermal shirts. 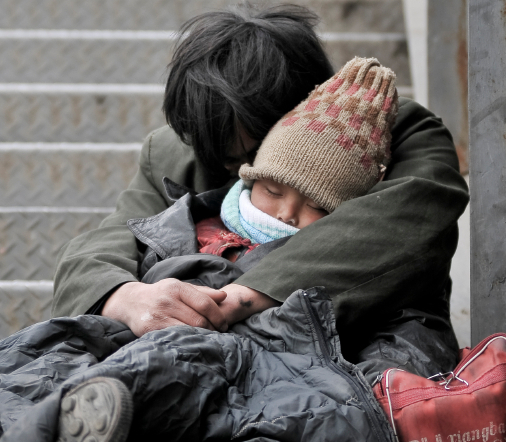 If you don’t personally know someone who is poor, work on that; but in the meantime, donate emergency fuel funds or warm clothing to an organization that provides desperately needed help. A bowl of soup, a pair of gloves, the warmth of unconditioned love shining on another…all good. Wherever you are, stretch yourself a bit. Write to your Congresspeople expressing your outrage that millions of our sisters and brothers are forced to choose between heat and food while the 1% grow wealthier by the second. Descry the policies and funding for war that create such suffering half a world away and in our own backyard. Maybe you feel called to refuse to pay the portion of your taxes that finances the horror. All of us can do something; imagine a world where we did. And one more thing. If your response requires you to make yourself known, utilize your networks, exercise public influence, go for it. But if not, don’t tell anyone what you have done. Acts of love, kindness, and generosity carry immense power when they spring from our deepest sense of connection and compassion, not our egos. Just do it. Warm Somebody. Shhhhhhhh.